Congratulations to the ACT Fencing Champions in the 2016 Rankings. Full results of the rankings and all the competitions can be found in the Main Menu (right). The Champions were recognized in the annual Presentation Day at The Canberra University Sports Hub. Thankyou to everyone that contributed to the success of the event, especially Di, Carl and Cerri. Can I hold your drink bottle? In a bid to help identify and support ACT Fencers at competitions we now have drink bottles. The premise is if you need support at a competition you can ask someone to hold your drink bottle or if you want to offer support you can ask to hold their drink bottle. We have been trialing this at a few events with great success. All competing ACTFA fencers will receive a free drink bottle at the ACT State Championships to encourage this initiative. 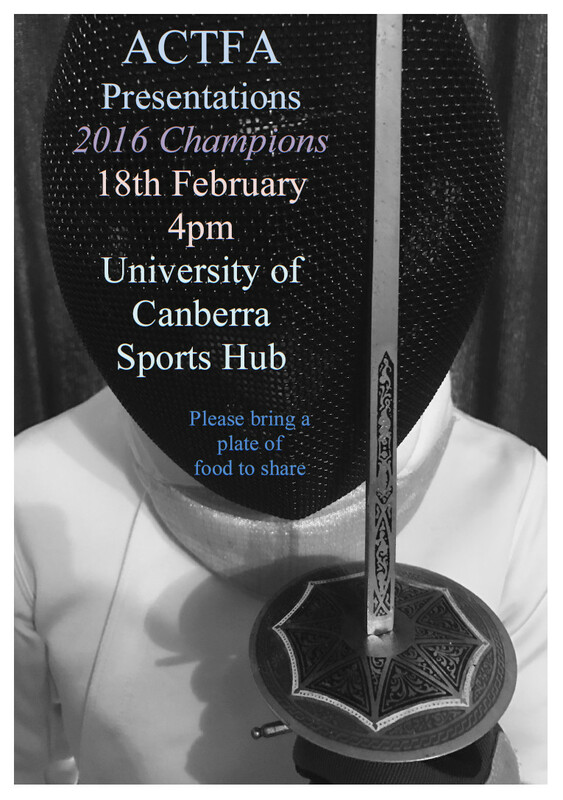 The ACT Fencing Presentation Day took place at the University of Canberra Sports Hub on Saturday 18th Feb The 2016 ACTFA champions across all categories were presented and recognized. Congratulations to all our champions, For full results, please visit the 'Rankings' link in the Main Menu. Thanks to the Makin family for the fun, fantastic event. The ACT Fencing Association is holding its Annual General Meeting on Saturday, 18 February 2017, starting at 2pm, at the UCAN, University of Canberra, Building 29, Sports Commons, University Drive North, Bruce, 2617. The Lancaster Fencing Club is starting up again in 2017. The first night back will be on Wednesday, 15 February 2017. Club sessions run every Wednesday from 7pm to 9 pm at the Lancaster Hall, Wesley Uniting Church Complex, Corner National Circuit and Fitzroy Street, Forrest. Training in all weapons (foil, epee and sabre). Full club details are in the attached document: 2017 Lancaster Schedule and Fees. Lancaster Club is also running a Beginner Level Fencing Course from March 1 to March 29, details can be found in the attached Beginner Level Fencing Course document. 2017 memberships are now available via the link in the Main Menu (right). Payment is by credit card or Paypal only. Full Memberships are valid until Dec 31 and Beginner memberships are valid for 3 months or until Dec31.